She's a reader. There's no denying that. She's also quite driven. At only 11, she has already chosen her desired college, major, and minor. And while I recognize that at eleven her opinions and plans might ebb and flow in the coming years, I also know HER and know that when she gets her sights set on a goal, there's no stopping her determination. That being said, the plan she has penciled in for herself after much prayer and self-evaluation requires a strong literary background. With that in mind, I have spent many months putting together a middle school reading list that will set her on that path. 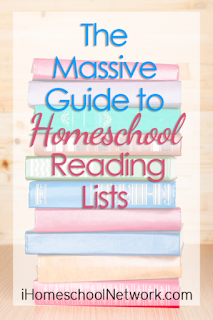 Since I'm not a huge fan of most modern reading lists and award-winning books, I have consulted only quality lists from sources that I trust which include THESE lovely gems, The Ultimate Guide to Homeschooling Teens, and The Home Scholar. I have pored over countless titles and have devised a list of 50 that I think represent a worthwhile sampling of different genres, themes, and eras. There is an intentional absence of non-fiction books since she reads so many of these already for our living literature style science and history. In my opinion, middle school is a time to start developing personal opinions and convictions on many topics while under the protective umbrella of home. That being said, several of these books contain gentle messages that will challenge her current belief system. While I don't introduce them to sway her from her Christian worldview. On the contrary, I hope to use these weightier-themed books to slowly help her grow stronger in her ability to filter EVERYTHING through a Biblical lens. My home is a greenhouse...a place where small buds can grow strong and form deep roots in Truth. Up until this point, so much of my daughter's growing has come from exposure to nothing-but-Truth. But now that she is in middle school and currently doing some high school level course work, she needs to learn how to weather the tough storms that the world will hurl at her by being gently released to find the Truth amidst the lies. With that in mind, I plan on reading several of these heavier titles with her. We will each read our own copy separately and dialogue about them as we are able, dissecting the Truth from the lie. 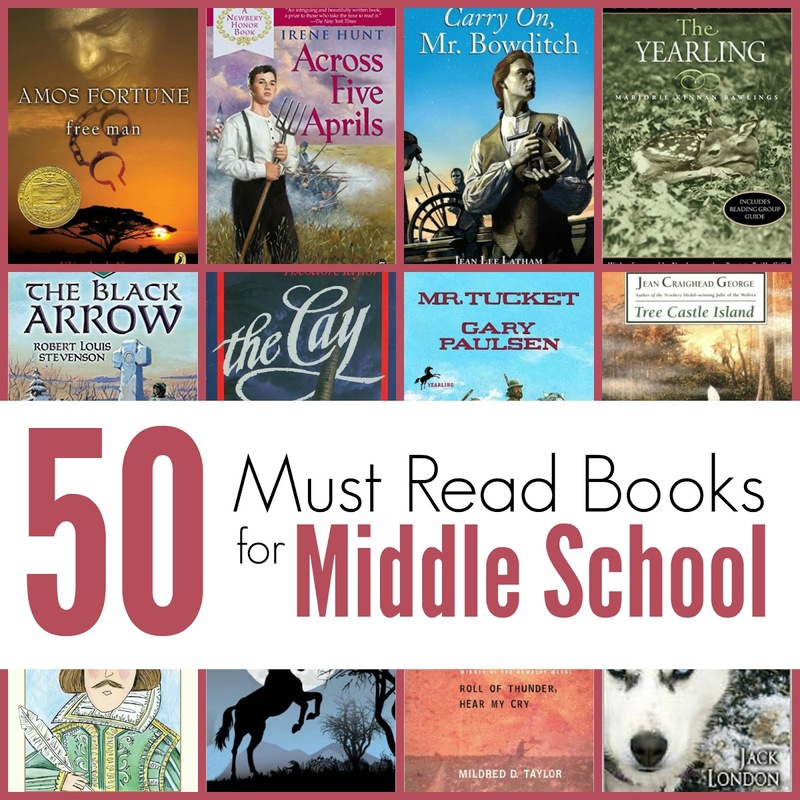 I have placed all of these books on a "shelf" called Middle School MUST READS in my Goodreads account so that she can see the list at a glance. There really is no structured order to it all. She is free to pick any title at any time. I don't necessarily expect her to read all of these books by the time she starts high school. (Then again, she's an avid reader and just might surprise me. She's actually read a handful of them already!) I mostly just want to set a wide variety of books in front of her that will each add an element of excellence to her literary journey without the worldly indoctrination that so many popular books offer. As always, when she finishes a book, she will document it for her annual portfolio and mark it as "read" in my Goodreads account. *Books that I am not as familiar with and will be reading alongside her. I love your list. We have many of the same titles on our list of 100 books and I will be adding a few from your list that I missed. I'd love to know what's on your list! Sorry about that. I meant to make a note at the bottom, but I clearly forgot. Got it fixed now. Thanks for making me aware. 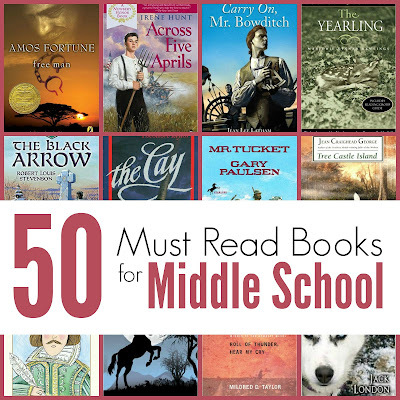 An interesting list with many books that I have enjoyed and some that are unfamiliar. This looks a long list but from my experience with an avid reader of this sort of age, you might be looking for more before the year is over. In terms of different view points, have you thought about "Children of the New Forest"? This is free on the internet and is an older book about the time of the English Civil War depicting a family who were ardent royalists. It might present a useful discussion about different points of view and is a good read. Ooo...gonna check it out. Thanks! I just created a goodreads account. I read your post about goodreads and how you use it for your family and homeschool. Back in May you stated that you had a private account but you might look to making it public. I was just wondering if it is public so that I can follow what you have in your shelves. Thank you for the great book list from one book list addict to another...lol! Oh, Tiffany, I keep meaning to do this, but just haven't gotten around to it. I will try and get to that really soon. I am just happy you share so much here on your blog! I appreciate your willingness to share as I understand how much time it takes! I'm a bit behind the times...how can I find your Goodreads account? You can find it here, Jenny. Great list. Do you have a similar one for upper elementary? and for 1-2nd grade? I have a general elementary list. It's not broken down into grade categories as every child reads at different levels. You can find it here. Your list looks nice. My Antonia will be quite a challenge for the average 11-year-old. Did you use study guides with any of this reading (specifically, The Diary of a Young Girl)? I'd like to use that as curriculum but haven't found a decent study guide to reinforce it. My 9th grader likes Progeny Press's e-guides and we're doing The Hiding Place next.